Editing an MP3 file is always necessary. For instance, shortening a song to create a ringtone for Android or other mobile phones; cut the large MP3 files to save space on your computer or share it to the social media with friends or family; add special sound effect to enhance original MP3 clips if you are a music enthusiast, etc. No matter what reason it is, if you want to edit MP3 music files or other audio files, you need a reliable MP3 editor, whether it is web-based or 3-party audio editing program. 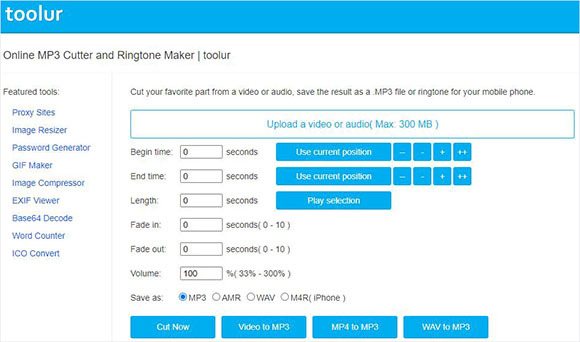 Now we will show you 2 simple methods to edit MP3 online or offline in just a couple of clicks. 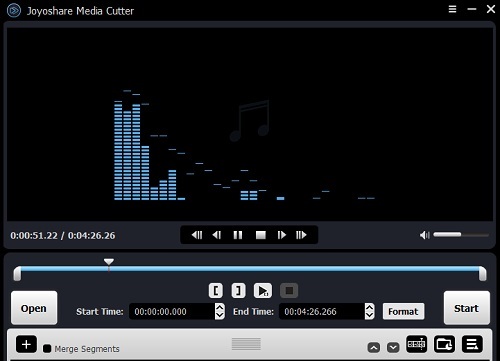 Joyoshare Media Cutter for Windows (or Joyoshare Media Cutter for Mac) is not only a video cutter editor, but also a simple-to-use yet wonderful audio cutter joiner and editor. With the program, you can easily trim your MP3 files into segments, and merge plenty of audio clips together without losing any quality at a lightning fast speed. Alternatively, you’re able to adjust the volume and weighting of audio file, insert a new audio clips to your MP3 files, add special voice effects to make your audio fantastic, and so on. 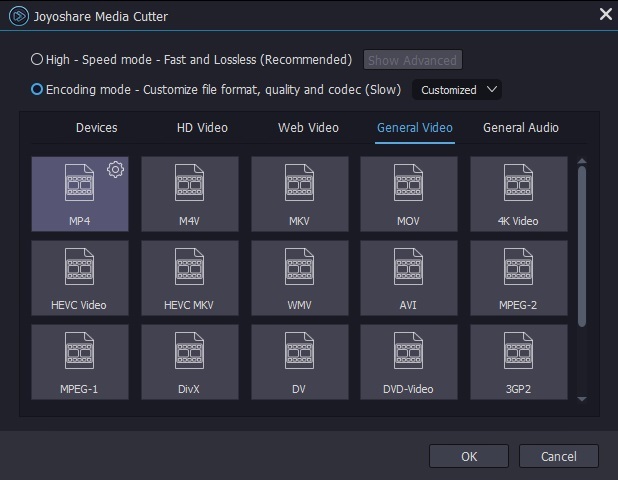 Besides MP3 formats, Joyoshare Media Cutter supports a wide range of other audio file formats including WMA, AAC, M4A, OGG, AIFF, RA, M4B, WAV, APE, FLAC, M4P, M4R, MP2, MPA, AC3, MKA, RAM, AA, AAX, etc. You’re also allowed to export your polished audio file onto many various popular portable devices like iPhones, Android phones, Windows Phones, smart TVs, etc, in other audio format like WAV, APE, FLAC, and many more. 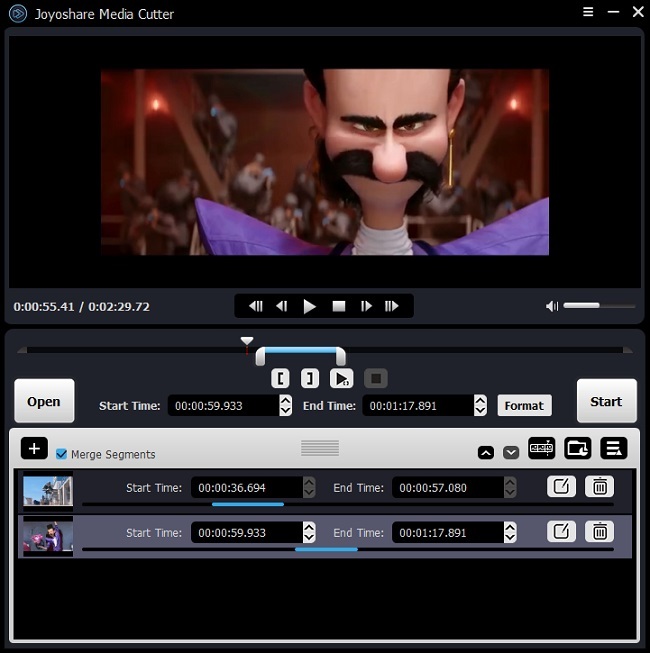 After download and install Joyoshare Media Cutter on your computer, you can start to edit MP3 files now. Launch the program and import the MP3 file you want to edit by clicking the "Open" button or just drag and drop it to Joyoshare. If you only want to do the basic editing such as cutting, trimming and merging, Joyoshare will help you realize it quickly without any quality damage. Click the "+" button to add more original clips. Let's just say, if you want three important parts of the audio file, you need to click "+" button for three times. Drag the yellow sliders to determine the parts you want to keep or accurately enter the start point and end point in millisecond-precision level. Do the same operation for another two parts. 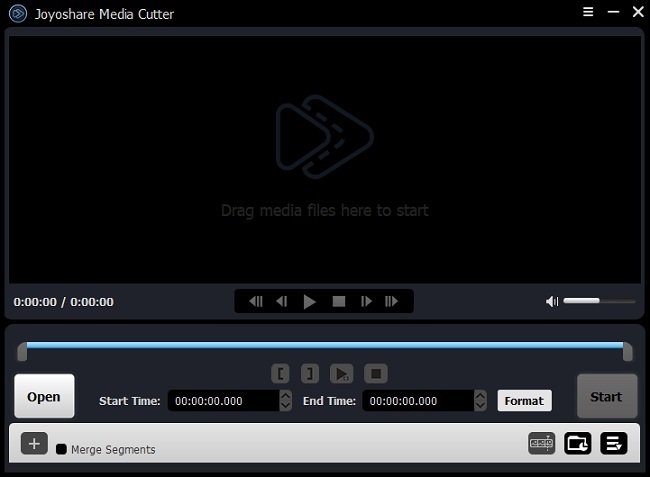 After finishing trimming, tick the "Merge Segments" option to prepare for combining these audio clips together. If you want to do more advanced edits for your MP3 music file, you can click the edit icon beside the clip and then a new window pops up. 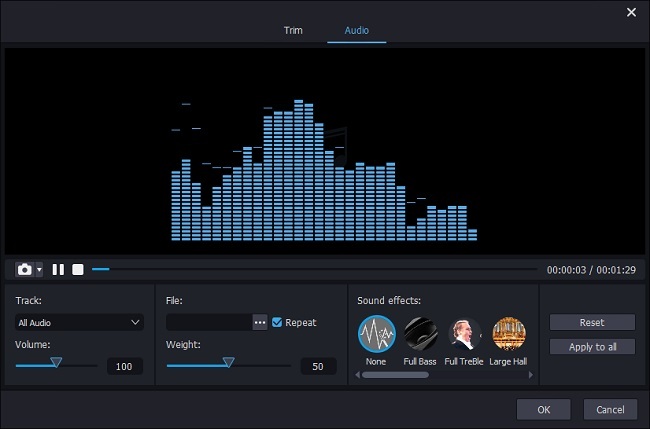 Hit the "Audio" tab on the menu bar, you are now freely to adjust the volume and weighting of the audio source to a suitable degree; add one special audio effect to improve the file; or even incorporate a new audio file into it by browsing the local folder, especially in some sound recording cases. Then click the "OK" button and close the window. If you only split and combine audio clips, you can select the "High-speed mode" by clicking the "Format" button, which allows you to cut and convert MP3 files losslessly and fast. Otherwise, please choose the "Encoding mode" and opt for a suitable output device as well. Click the gear icon on the top right corner to change the codec, channel, sample rate and bit rate if necessary. Then click the "Start" button to begin to trim and convert your audio. After a while, your polished MP3 file will be saved on the hard drive of your computer. You can click the destination folder to get it. To edit MP3 online, there are a lot of options for you. Some web-based audio MP3 editors are always crashed or needs much time to upload the audio file. We tested many such programs and find mp3cutter.toolur.com is a reliable and easy-to-use one. Then we will show you how to edit MP3 free of charge with this online tool. 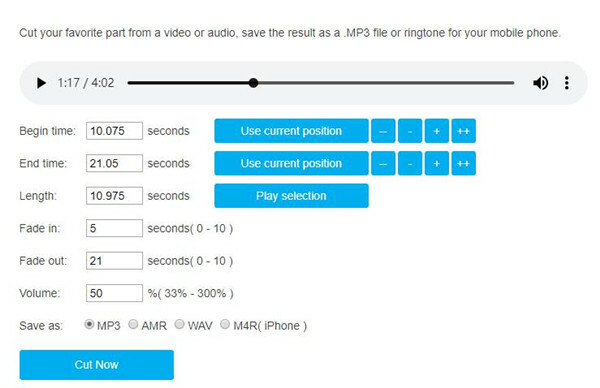 Click the "Upload a video or audio" button to import the MP3 music file you want to cut and edit. Note that your audio file size cannot exceed 300MB. You can manually key in the accurate begin time or end time and length of the song will be shown automatically. Or, just press the blue button "Use current position" to determine the start time and end time while you’re hearing the music file. The "+" and "-" buttons will help you to correct the duration more precisely. You can also choose to add fade in or fade out effects and adjust the volume of the voice, etc. Next select an audio format you like from MP3, AMR, WAV, and M4R for iPhone. Then click the "Cut Now" button to trim your audio. Now hit the "Download Now" button to download and save the new audio in your computer’s hard drive. Note: This online MP3 editor can only do the basic editing for the audio file such as cutting, trimming, and splitting. And most web-based tools just have such simple functions. If you need more edits for your MP3 music file, you can turn to the aforementioned smart audio editor - Joyoshare Media Cutter for help.